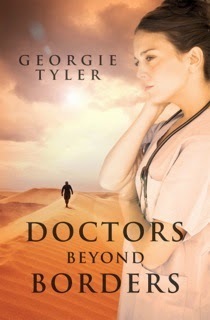 "Medical workers in Sudan meet danger and romance"
Having agreed to work with charity Medecins Sans Frontieres, Dr. Ariadne Tate travels to Sudan in DOCTORS BEYOND BORDERS. She's from Australia so the heat isn't too big an issue. Reckless drivers and basic bathroom facilities are less welcome. She has no intention of getting involved with colleagues, having found the hard way that such romances are not ideal. Kidnapped aid workers and armed militia driving around their compound make life uneasy for the medics, who are surgeons, nurses and midwives trying to do their best in this war-torn country. Another doctor, Ford Gosden from America, seems to know his way around, and he has an effect on Ariadne beyond friendship. He has been known to have light romances, but never with colleagues, and he silently expects that one tour in Sudan will be enough to send Ariadne packing. Disease, gunshot injuries, malnutrition and parasites are not helped by lack of standard medical facilities, so improvisation is the way to go while the heat saps strength. On a three-week tour of villages with Ford, Ariadne's familiarity with Arabic comes in useful, but there's nowhere to hang her mosquito net, and she needs to beware of scorpions. The political situation is ropey and people have no security, no wealth. Seeing the crude, perilous environment helps us understand how co-workers may start a relationship for escapism as much as love. Anyone interested in volunteering will be fascinated by this story of hard-pressed people striving to make a difference, while those looking for a romance may count it among their more unusual reads. Landscape descriptions are simply put but effective: when the rains suddenly start, the paprika surroundings turn to a sea of melted chocolate. Aid workers whose stories I've read fantasised constantly about food, and that does seem to apply here, with one good restaurant meal on a sojourn amounting to a feast. Then it's back to the brutal reality and drama of Sudan, where foreign women are in particular danger. Georgie Tyler has done well to show the tension-filled actuality behind what we see on TV screens in DOCTORS BEYOND BORDERS. I'll be looking out for her next venture into adult romance and realism. When Ariadne Tate takes a deployment to Sudan with a medical aid organisation, romance is the last thing on her mind…but Dr Ford Gosden puts a glitch in her plans. Too damn attractive for his own good and a thoroughly nice guy, Ford slowly seeps under Ariadne's skin. Reviews like this by book reviewers like Fresh Fiction make all the hard work, angst and self doubt worth it. Not much comes close. Thank you Clare O' Beara.